Yeh, the Molokai cowboy is riding in the wind. From the slope below me, rust-red dust powdered the air, nearly obscuring the half-dozen people on horseback urging on the herd of yearling Brangus cattle. Some looked obviously comfortable, settled into the saddles, but most were holding on, vaguely uncertain of their surroundings. Some had never been on horseback, and most of the others had only limited experience. Easiest in the saddle was Jimmy Duvauchelle, a fourth generation Molokai cowboy or, as they're called on the Hawaiian Islands, paniolo. For Duvauchelle, the ranch's head cowboy, or "cattle manager," his Molokai Ranch roots go back a hundred-plus years to his great-grandfather. A night earlier, Duvauchelle had teamed with other paniolos, including Phil Stephens, 39, at an evening program that featured paniolo songs, including the naturally appropriate "Molokai Cowboy." "This is my dream, not only to work like this, but because the paniolo lifestyle was my dream since I was young," explained Stephens, who strummed a ukulele and sang while riding horseback on the cattle drive. "You are here to have fun, but we are putting you to work," said Duvauchelle, 54, before the cattle drive. He's had fun working on the 54,000 acre ranch, second largest in the Hawaiian islands, for more than 30 years. "Always it's been in the family," he explained. The tradition continues. Among the others who kept watch on the ranch guests during the ride was Duvauchelle's daughter, Deanna Kelilhoomalu, 28. Earlier in the day her husband, Kalapana, 29, another ranch paniolo, frolicked with another group of ranch guests at a round-up, where he shouted and urged riders in light-hearted pole bending, cattle penning and other horseback competitions. 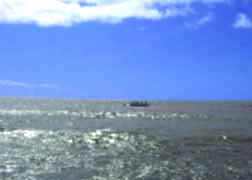 Paniolos help guests learns "the ropes"
Molokai is the island few Hawaii visitors see. Located between the heavily touristed islands of Oahu and Maui, the island is best known for its leper colony and legacy of Father Damien. The 19th century Belgium priest lived with and helped the outcasts, until he eventually died of the dreaded disease. The Molokai Ranch hopes to lure Hawaii visitors searching for something other than mai-tais, hula dancers and luaus. Since opening the first of three camps in February 1997, the ranch has focused on ecotourism. Guests are encouraged to participate in horseback activities, paddling sea kayaks or outrigger canoes, mountain biking, body boarding, surfing, snorkeling, shore fishing, playing volleyball, or cultural hikes. Theres also plenty of opportunity to just kick back: sunbathe, curl up in a hammock, view nighttime stars through barrel-sized telescopes, listen to the sounds of thudding ocean waves, or hear the wind rustling through Cooke pines and palm trees. At the Molokai Ranch, you can do it all, or do nothing at all. The ranch offers three camps with three distinct personalities. 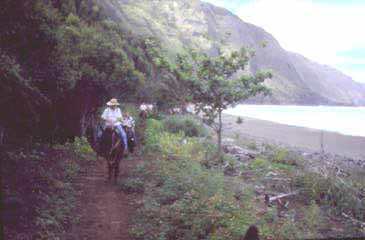 The Paniolo Camp, about a mile from Maunaloa town, offers easy access to horse-related activities and mountain biking. The camp, located about 1,100 feet above the ocean, features 40 one- and two-tentalow units. Tentalows are canvas-covered framed structures made comfy with queen-sized beds, ceiling fans and storage boxes refilled daily with selections of soft drinks and bottled water. The tentalows open to large decks with private, expansive views and, a few steps away, open-air restrooms with showers and self-composting toilets. 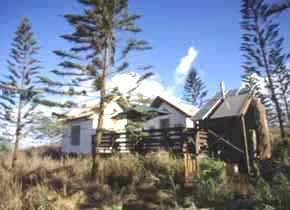 Kolo Cliffs Camp sits atop a rugged bluff over Molokai's south shore. Designed for honeymooners and others seeking isolation, the camp has 20 luxurious domed tents, or yurts. The decks at Kolo look out toward Lanai and Maui. From the lava-like trail that connects the yurts, another trail offers a 5-minute walk to beaches where many of the water-oriented activities are offered. Tentalows at Paniolo Camp Newest of the trio is Kapuoa Beach Camp, with 40 pairs of tentalows just a stroll away from two crescent-shaped beaches. The sandy beach offers swimming, snorkeling, body boarding and sunbathing, while the other frames lava rocks and tide pools. Kapuao is especially designed for family activities, including many designed for children. Each camp has its own director, who schedules activities and arranges transportation. 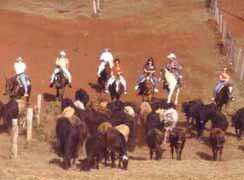 The cost of a ranch visit includes shuttles to and from the Molokai Airport, transportation around the ranch, daily maid service, most of the smorgasbord of daily activities and three meals a day. About those meals -- we feasted on all-you-can-eat portions, from morning flapjacks, to noon cheeseburgers, to evening offerings that included ranch-grown beef, locally caught fish, and enticing selections served in open-air halls. I wasn't sure if we ate because we were hungry from all the exercise, or if we exercised so we could be hungry. 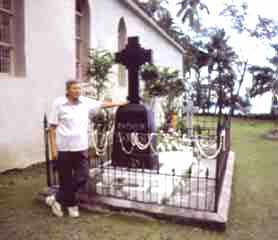 With the help of our activities director, we arranged a day-trip by mule to Kalaupapa, where Father Damien spent 16 years as pastor and physician for banished lepers before contracting and dying from the disease in 1889. Unless invited by a resident, visitors must take a tour.We were met outside Kalaupapa by Richard Marks, who ushered us into an old school bus for a narrated tour of the settlement. Marks, 69, has leprosy, offically called Hansen's disease in Hawaii. Since the 1940s, drugs have eliminated the need to isolate patients. But, like the settlement's 45 other permanent residents, he lives in Kalaupapa because it's home. "We're a drying breed," said Marks, who remembers the years when he and others lepers were segregated from the medical staff and visitors by 8-foot high barbed wire fences. "The grumbling goes on, but it's a much better way of life." Marks is a living encyclopedia about Damien, born as Joseph de Veuster in Belgium. It's impossible to not be emotionally moved by the stories of Damien, the raw beauty of the site, the simple grace of St. Philomena Church, and Damien's neighboring gravesite. Pope Paul VI declared Damien venerable in 1977, the first step toward sainthood. Damien was blessed by Pope John Paul II in 1995, the second step. Interest in Damien will be renewed in early 1999 with the release of a new film, "Father Damien," starring Kris Kristofferson and Peter O'Toole. Marks served as a film advisor. Reaching Kalaupapa requires navigating a 3.2 mile trail down a spectacular sea cliff that angles around 26 switchbacks, dropping 1,700 vertical feet. Although reachable on foot, riding sure-footed mules is the most popular transportation -- for good reason. The mule ride is truly a unique experience. When the trail isn't weaving through thickly vegetated forests, the exposed ridge offers stunning views of the nearly flat, 10-square mile peninsula that's fronted on three sides by the Pacific Ocean. 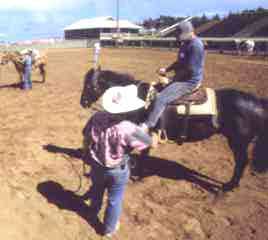 Glenn "Kaleo" Lenwai, a singer with a group that performed at Paniolo Camp, serves as head muleskinner for the Molokai Mule Rides. The effusive Lenwai really makes his riders feel at home in the saddle. He proudly mentioned that he plays a small part in the upcoming "Father Damien" film. "So I'll just smile and say 'Aloha' until then"
Our five days on Molokai introduced us to an unforgettable slice of life on the island. Molokais culture, traditions, history, and beauty are so well complemented by its tranquil, non-touristy ambiance. Each days journey was an adventure in itself, whether on bicycle, in kayaks, on foot or, best of all, saddled atop mules and horses. As the song says, "we hope someday to go back again, so we'll just smile and say 'Aloha' until then." Click here for details to plan your own trip to Molokai.